Welcome to the third newsletter from the APEnet project (Archives Portal Europe). The APEnet project consists of seventeen European national archives working in close co-operation with Europeana on this three year project. The project is co-financed by the eContentplus programme and its aim is to create a common Gateway for Archives in Europe. The first version of the Archives Portal Europe is now online at archivesportaleurope.eu! You can search across the holdings of 47 institutions, 7.797.809 descriptive units and 726.136 digital archival objects. We welcome your feedback which can be sent using the contact form. Please note that this is a beta version. APEnet will hold a three day conference and workshops on metadata migration and the use and development of archival standards (EAC-CPF, METS, OAI-PMH). 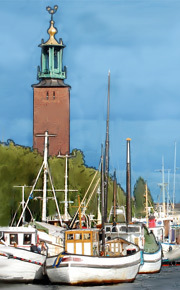 The conference will take place on 28-30 June 2011 in Stockholm, Sweden. Highlights from the agenda will include presentations by Europeana, EAC-CPF expert Daniel Pitti, Delving, and of course by APEnet members themselves. During the 3rd General Assembly held on the 10th of March 2011 in Brussels, a Working Group was established to revise the EAG (Encoded Archival Guide) standard. This revision is aimed at greater compliance between EAG and ISDIAH (International Standard on Describing Institutions with Archival Holdings) and will examine the possible adoption of the latest changes in related standards, especially EAC-CPF (Encoded Archival Context - Corporate Bodies, Persons, Families). From 14-16 February 2011 there was a technical evaluation meeting held in Paris. The main goals for this meeting have been to evaluate the tasks achieved so far and to discuss the further technical developments based on this evaluation. On the way to the final version of the Archives Portal Europe due in January 2012, two intermediate releases have been settled, one in early June 2011 and one in early November 2011. Both will concentrate on certain improvements and enhancements of the current implementation. While for the June release the improvement of the display, the enhancements of the search functionalities and their usability as well as some additional functionalities in the backend of the portal will take the lead, the major tasks for the November release will be the addition of certain user functionalities for the portal or the integration of more archival standards like EAC-CPF. You can read about our activities for 2010 on our web page, News section. APEnet intends to organise two GA meetings in 2011. The APEnet project will contribute to the next Europeana production release, the Danube release, due in April 2011, but this time the contributions will be based on the interoperability as implemented in the Archives Portal Europe pilot. During the general assembly of EURBICA in Oslo, Norway two meetings of the APEnet liaison group were announced. The first one will take place on 12 April 2011 at the Bundesarchiv (Swiss Federal Archives) in Bern, Switzerland. The aim of the APEnet liaison group is to inform EURBICA members - particularly those countries that are non-EU members - about APEnet and the way of integrating data into the Archives Portal Europe. APEnet will do two more releases of the pilot during 2011: 1 June and 1 November. A three day conference will be held in Stockholm, Sweden on 28-30 June 2011. APEnet intends to organise several workshops in 2011: for instance, workshops on METS, EAC-CPF and OAI-PMH will be held during the conference in Stockholm in June. APEnet will participate in the CITRA conference in Toledo in October 2011.